Seven fun shops to hop through and shop through! Stop at all of them to qualify for great prizes...including an overnight trip to the AQS show in Des Moines. Click here to see all the shops in this years shop hop. There are some huge discounts on kits, books, patterns, quilt samples,fabric bundles, scrap bags, $1 fats, $3 flat folds and $4 yardage. You DO NOT want to miss this gigantic event! 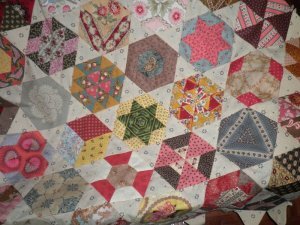 And...we are so excited to welcome SUE DALEY of Eumundi, Australia for a weekend of classes and a trunk show showcasing all of her spectacular quilts. 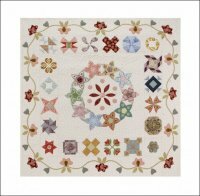 Sue specializes in English Paper Piecing and Needle turn applique. She is a great instructor and fun to just sit and listen to -- you'll probably learn some new Australian lingo, too! We have a full brochure to let you know all about the trunk show, classes and a little more about Sue. Click here to download and print it out! If you are at all interested in signing up for one of the classes...don't delay. Classes are limited to the first 30 paid students. And that's not all that's going on here at Merry's! We have other BIG news coming at you very soon, too. Stay tuned!